FSA was founded in 1941 by J. Harold Seibert RLS, PE. 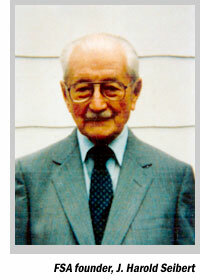 Mr. Seibert was the appointed County Surveyor for Washington County, Maryland from 1941 through 1972 when the State of Maryland abolished the County Surveyor's system. The firm continued with its combination of private and public sector work through 1986 when it was incorporated as Frederick, Seibert and Associates, Inc. (FSA). Today the firm is a 25+ member firm that prides itself on engineering excellence, hard work, and a commitment to service for our clients. Our clients come from both the public and private sectors. Some of FSA's public sector clients include: The U.S. Department of Defense, U.S. National Park Service, Maryland State Highway Administration, Washington County Board of Education, Washington County Commissioners and the City of Hagerstown. Our private sector clients include: Home Construction Corporation, Verizon Telecomunications,Sheetz, AC&T, and 7-Eleven Stores, Wendy's, Burger King, IHOP, TGI Friday's, Uno's Chicago Bar & Grill,Washington County Hospital, Robinwood Medical Center, Frederick Memorial Hospital, Manekin Corporation, Martins Food Stores, Weis Markets and Homewood Retirement Centers. Our design of these and numerous other projects have ranged from the initial concept stages through complete design, agency approval process, construction stakeout and project supervision. Our services have covered engineering feasibility studies, field surveys, concept plans, site planning and engineering, land planning and subdivision, landscape planting plans, water resources, wetlands analysis, delineation and mitigation, stormwater management, stream restoration, sediment and erosion control, roadway and utility design, construction stakeout, construction supervision, as-built drawings and final lending institution inspections. In addition we have assisted many of our clients in the preparation of graphic art and materials used in their marketing programs. As part of our continuing effort to offer our clients the very best engineering, surveying, planning and landscape architecture services possible, FSA has systematically invested in our state of the art computer aided drafting and design department (CAD). All projects we complete make use of our networked CAD department. 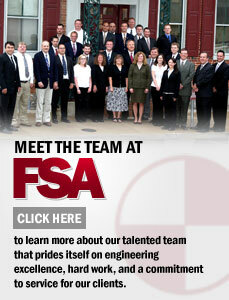 We at FSA would welcome the opportunity to provide our services to your organization. If you need any additional information about FSA or you wish to contact any of our references, please give us a call. Finally, we promise to provide you with the best of our engineering talents in an expeditious manner and using the most cost effective approach.